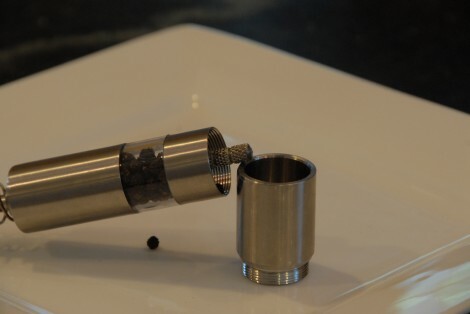 This is just a quick review of a couple of very small pepper grinders I’ve picked up lately, with the idea of finding something to throw in my travel kit. I was surprised at how well these little mills worked. They have ceramic conical burr grinders, and produce a very fine and consistent grind of pepper (and salt). Because of their size, they only hold a couple teaspoons of peppercorns or sea salt. 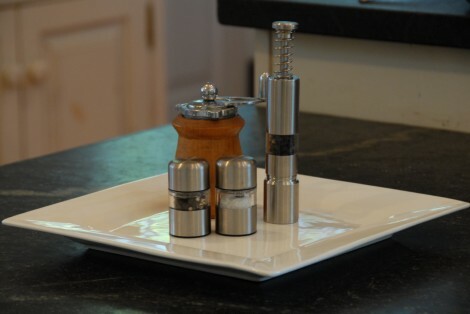 The pepper mill had no problem at all with Tellicherry peppercorns, unlike many other grinders I’ve tried. Due to their capacity and relative slowness of grinding, they wouldn’t serve kitchen duty for me, but they would be great at the table or in a picnic basket. I’m not sure how durable they will prove to be, but they are reasonably inexpensive. I’ve seen a number of different brands associated with this type grinder, and looking closely at the products I suspect that they are made by the same factory and just sold under different brands. Taking this stainless steel model out of the package I had high hopes – it was heavy, and felt very well built. In operation, it wasn’t as impressive. 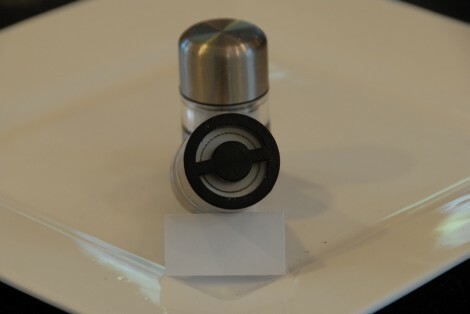 The actual grinder mechanism is just a burred steel shaft, and it produced an uneven grind. It did manage to feed through the Tellicherry peppercorns, but not easily. Finally, even though the action of grinding seem easier the amount of pepper ground was about the same as the Mini Mills.